We can’t really talk about horror paperbacks from the ‘60s and ‘70s without talking about the celebrity led anthologies. A smart move by the publishers to shift items off the shelves, nothing sells like celebrity. Of course, we have the more obvious choices such as the iconic horror actors, Peter Cushing, Christopher Lee & Boris Karloff lending their names to anthologies, but here we have a selection of twenty tales of terror from the legendary stumpy-fingered stand-up comedian and religious sceptic, Dave Allen. …an old man with white hair and a flowing white beard, who lived in the village and whom I believed to be a hundred years old. Sometimes I used to play truant from school just to go for a ride in his pony and trap, and listen to the legends of wild banshees and headless coachmen. Allen never strays too far from the obvious with the contents of his collection and gives us a selection of classic tales from mostly household-named authors. He implies in his introduction that he’s brought these tales together to provide a broad overview for the newcomer to the genre and, as a collection, it works very well. This is the original ‘be careful what you wish for’ tale, being about a small family of mother, father and grown-up son acquiring the titular item from an old friend of the family who visits them on a suitably stormy night. The friend, a retired Sergeant Major, sits by the fire drinking whisky and recounting stories of his campaign days in India when he pulls from his pocket a mummified monkey’s paw, claiming it was created by a Fakir to give three men three wishes each. The friend throws the paw onto the fire, declaring it to be evil, but the father quickly retrieves it…with dire consequences, of course. Without, the night was cold and wet, but in the small parlour of Laburnum Villa the blinds were drawn and the fire burned brightly. However, at some point in its publishing history Laburnum Villa became Lakesnam Villa, and that is how it is in this edition. I’ve no idea when, why or how this happened. What the hell is a Lakesnam anyway? If anyone has any more information on this I’d love to hear from you! This is that famous story by M. R. James, the one about the fusty old Cambridge scholar who goes on holiday and sees a ghost? Oh, hold on a minute, that’s not really narrowing it down much, is it? Possibly the most famous ghost story ever written? Thanks, in part, to the splendid 1968 adaptation from Jonathan Miller which featured a remarkable performance from Michael Hordern and kicked off the BBC’s Ghost Story for Christmas season. Oh, Parkins,” said his neighbour on the other side, “if you are going to Burnstow, I wish you would look at the site of the Templars’ preceptory, and let me know if you think it would be any good to have a dig there in the summer. So now we have this particular fusty protagonist introduced, Parkins the Professor of Ontography. Interestingly, there is no such thing as Ontography in standard academic circles, it’s thought to be one of James’ neologisms. This could not have been a mere error from James as he was completely immersed in academia, being a medieval scholar and Provost of King’s College. There is of course Ontology, the study of the nature of being and existence, but not Ontography. Why he did this is anyone’s guess. Which all works out rather nicely considering the context of the story. An academic who is completely sceptical of the supernatural goes on holiday to the East Coast and finds an ancient whistle on the site of a Knights’ Templar tomb. When blown, this whistle summons a spirit which haunts poor Parkins and shakes his entire worldview. As often is the case with James, the sense of place, the way in which the environment affects the psyche, is key in this story. Psychogeography! Perhaps not such a new thing after all! Yet another massively famous story and yet another one which was adapted for the TV in the BBCs Ghost Stories for Christmas strand. This time from Charles Dickens. Dickens was obviously most famous for his rather broad social commentary novels, so it’s easy to forget what a damn good short story writer he was too. Remarkable how he could switch between the vast sprawling forms of his novels and the tightly written, controlled and economical prose of his short stories. …and drawing nearer to him, saw that he was a dark, sallow man, with a dark beard and rather heavy eyebrows. His post was in as solitary and dismal a place as ever I saw. On either side, a dripping-wet wall of jagged stone, excluding all view but a strip of sky; the perspective one way only a crooked prolongation of this great dungeon; the shorter perspective in the other direction terminating in a gloomy red light, and the gloomier entrance to a black tunnel, in whose massive architecture there was a barbarous, depressing, and forbidding air. So little sunlight ever found its way to this spot, that it had an earthy, deadly smell; and so much cold wind rushed through it, that it struck chill to me, as if I had left the natural world. It’s fascinating that we read this story now as a relic from the distant past, with all of the trapping of the Victorian gothic, but it’s worth remembering that when Dickens wrote it in 1866 the railway was still a very new thing. In fact, the real-life train crash which is thought to have inspired the piece only happened five years before it was published (Clayton Tunnel in Essex, if you’re interested). Saki was the nom-de-plume of the Edwardian author H. H. Munro. He is quite rightly considered to be one of the great masters of the short story form and is often mentioned alongside such names as Anton Chekhov and Guy de Maupassant. This story, as is typical of his work, is a very short short story. Saki rarely wrote tales of more than two thousand words but, when you write with such succinctness, there’s really no need to labour the point. This story, again being typical of his work, is a satire of Edwardian manners. There is a side story about long dead corpses rising from the bog they were drowned in but the real horror, one that strikes fear into my own heart, is one of being forced into sociability and unsolicited conversation. The horror! Clarimonde or, to give it the original title, La Morte Amoureuse is a fascinating and often overlooked early piece of Vampire fiction. People talk of Stoker’s novel, Dracula, and those in the know will say “Ah, but he wasn’t the first, what about Le Fanu’s Carmilla? What about Polidori’s The Vampyre?”, but this little gem is rarely mentioned. It has everything you would expect from a 19th Century tale of Vampirism; rich in imagery; darkly Gothic; nightmarish horseback chases on black stallions through midnight forests; porcelain skinned beauties; tormented priests. It’s heavy on the Romanticism and equally heavy on the Decadence. What else would one expect from a famed poet and playwright with an obsession with death and the horrors of life who attended the same school as Charles Baudelaire, Voltaire and The Marquis de Sade? What the hell were they teaching there? What can one say about any of Poe’s tales of the macabre that hasn’t been said a thousand times before? We all know them, anything I write would surely be superfluous. Instead, shall we all sit back, relax and luxuriate in Tom O’Bedlam’s mellifluous voice giving us a reading? This tale of a put-upon ghost doing his best to haunt his stately home when a new family move in serves as a vehicle for Wilde to humorously highlight the divide between British traditionalism and the new US consumerism. And, not being the most subtle of authors, he does slap the reader around the face with it. It’s interesting to include a humorous piece in an anthology such as this. The concept of the comic interlude has a long and noble tradition. The Elizabethan dramatists were big fans of placing a farcical element in the middle of a drama to throw the seriousness into stark contrast. Shakespeare obviously used the technique widely, such as in the Porter scene in Macbeth. In Italian opera too, a comic Intermezzo is often used between acts of a dramatic performance. The Japanese have their own version too, their Kyōgen (mad words) performs the same role. I’m sure that most readers here will also recognise the technique from some of the British portmanteau horror films. The golf sequence in Ealing’s Dead of Night? The Elemental in Amicus’ From Beyond the Grave? The Neat Job in Amicus’ The Vault of Horror? Yes, however misplaced we sometimes think these comic reliefs may be, they do seem to serve a purpose. Alfred McLelland Burrage was a very prolific author. Along with his ghostly tales he also published many comedies and loves stories but is probably best remembered for his Great War memoirs, War is War, which he published under the pen-name of Ex-Private X. From his horror short stories I suppose his most famous would be The Waxwork (the one we usually find anthologised) but here we have one that is a little less well known. The opening paragraph is the sort of opening that fills me with dread for all the wrong reasons when reading a horror story. It’s a flabby, adjective heavy piece of prose, it’s all ‘great doors, meagre light, windy autumn evenings, grey light, veils of dingy clouds, and cavernous darkness’. However, it soon settles down and becomes an extremely well-paced and solid entry in the genre. What a tremendous author Guy de Maupassant was. One of the finest exponents of the short story form and massively influential. This tale is a typically nihilistic piece, being about the hypocrisy of the post-mortem idealisation of our friends, acquaintances and family. de Maupassant takes the idea of the phrase ‘De mortuis nil nisi bene dicendum’ (Do not speak ill of the dead) and turns it on its head; what if the dead could speak for themselves? Daphne du Maurier, another of my favourite authors (…most of my favourite authors seem to be female, I wonder why that is). I was going to write a fairly lengthy piece about this one but it’s such an interesting story with a fascinating and troubled history that I think I’ll save it and devote a whole post to it soon…watch this space. Good grief, we’re spoilt for choice with the literary heroes in this anthology. Now we have William Sydney Porter under his most famous pen name, O. Henry. He’s another one considered to be a master of the art of the short story, often with the epithet of ‘The American Guy de Maupassant’. Porter didn’t often stray into the realms of the supernatural with his work, and this tale just skims the surface of the subject. It’s a beautifully written piece about a lost love and the despair and isolation of living in poverty in the big city. Porter writes with a sense of the poetic, how can you resist an opening paragraph like this? Restless, shifting, fugacious as time itself, is a certain vast bulk of the population of the red brick district of the lower West Side. Homeless, they have a hundred homes. They flit from furnished room to furnished room, transients forever – transients in abode, transients in heart and mind. They sing “Home, Sweet Home” in ragtime; they carry their lares et penates in a bandbox; their vine is entwined about a picture hat; a rubber plant is their fig tree. This is a tale of love, superstition and witchery among simple country-folk. Well it would be, wouldn’t it? It’s Thomas Hardy. I’ll freely admit to not being a fan of Hardy’s prose (his poetry, on the other hand, I like. He handled verse with far more skill). Having said that, I actually find this short story quite charming. The sort of thing you could imagine Hammer or Tigon adapting for a film in the ‘70s. In fact, I’d imagine the story would be quite popular today with the current trend in what has become popularly known as Folk Horror. Hardy wrote this in 1888 and it’s set in 1833, so he’s essentially writing a trashy piece of historical fiction in which he romanticises the past. By today’s standards it would be something akin to one of the constant barrage of ‘vintage’ tv programs the BBC produce, Call the Midwife, Landgirls, something of that ilk. Yes, it’s clichéd; yes, it all gets a bit histrionic; yes, you can see the end coming from a country-mile away. But, putting all those things aside, it’s quite a fun read. This is a jauntily written tale concerning a chap who, after having suffered from nervous exhaustion, found that he was cursed with the talent of precognition. Yes, cursed. Apparently, seeing the awful nature of your own death seven years in the future can really take the fun out of such a thing. James Frank Sullivan seems to have had a more successful career as an illustrator and cartoonist than as an author, having written only a handful of short stories, most of which appeared in The Strand magazine in the late Victorian period. As far as I can gather, he had two collections published; The Queer Side of Things (which contained this and his other Strand stories) and The Flame Flower and Other Stories (which contained a parody of The Island of Dr Moreau). Sadly, he doesn’t seem to have been reprinted or anthologised much through the 20th Century. This means I may have to try and hunt out his early books! Aaah, Sax Rohmer and his casual racism. He’s best known, of course, for his tales of inscrutable Oriental types. A product of his times, Rohmer encapsulated the threat of the Yellow Peril with his immortal character, Dr Fu Manchu. This story comes from his 1922 collection, Tales from Chinatown. It’s a rollicking and rather bizarre tale concerning a half-Chinese/half-European violinist, a burly Scottish failed artist, bohemian lifestyles, a chemist who as discovered a process for turning living matter into gemstones, an explosion in a T.N.T. factory and unnecessary dental work. Now, we all know Doyle can spin a good yarn. Of course he can, it would be churlish to try and say otherwise. But, does his supernatural fiction work? Taking this story as an example, I’d say no. It starts off well enough; suitable prologue which draws the reader in; nicely Gothic locations; good characterisation. It all trots along nicely until we get to the actual nub of the story which Doyle writes in such a linear fashion and deals with in such a matter of fact way that it removes any sense of eeriness or tension. Obviously not a good thing to do in a ghost story. I wonder whether Doyle’s bullish attitude towards the subject of the supernatural overrides his obvious skills as a writer. And we finally arrive at the highlight of this anthology. Not a bad accolade for a book with so many highlights! I make no secret of the fact that Shirley Jackson is one of my favourite authors. I love a bit of ambiguity in my fiction and Jackson certainly does the ambiguous very well. She keeps her cards close to her chest when it comes to her themes, making them seem allegorical. This, of course, involves the reader in the story and makes them continue to think about them long after closing the book. It’s very difficult to forget a Jackson tale, they have a tendency to linger. Things began mildly enough with a note from a friend at The New Yorker: “Your story has kicked up quite a fuss around the office,” he wrote. I was flattered; it’s nice to think that your friends notice what you write. Later that day there was a call from one of the magazine’s editors; they had had a couple of people phone in about my story, he said, and was there anything I particularly wanted him to say if there were any more calls? No, I said, nothing particular; anything he chose to say was perfectly all right with me; it was just a story. One of the most terrifying aspects of publishing stories and books is the realization that they are going to be read, and read by strangers. I had never fully realized this before, although I had of course in my imagination dwelt lovingly upon the thought of the millions and millions of people who were going to be uplifted and enriched and delighted by the stories I wrote. It had simply never occurred to me that these millions and millions of people might be so far from being uplifted that they would sit down and write me letters I was downright scared to open; of the three-hundred-odd letters that I received that summer I can count only thirteen that spoke kindly to me, and they were mostly from friends. Even my mother scolded me: “Dad and I did not care at all for your story in The New Yorker,” she wrote sternly; “it does seem, dear, that this gloomy kind of story is what all you young people think about these days. Why don’t you write something to cheer people up? If you haven’t read The Lottery yet then go out and buy it now. In fact, go out and buy all of Shirley Jackson’s back catalogue. You won’t regret it. Joseph Conrad is up next so, obviously, it’s a tale of adventure and derring-do on the high seas. Conrad wrote some incredibly important works of great literature in his time. This isn’t one of them though. He was a tall, one-eyed Asturian with scrubby, hollow cheeks; a grave expression of countenance contrasted enigmatically with the roaming restlessness of his solitary eye. In front of them, just within the threshold, the little man in the large cloak and yellow hat had taken his stand. He was a diminutive person, a mere homunculus, Byrne describes him, in a ridiculously mysterious, yet assertive attitude, a corner of his cloak thrown cavalierly over his left shoulder, muffling his chin and mouth; while the broad-brimmed yellow hat hung on a corner of his square little head. He stood there taking snuff, repeatedly. The lad in goatskin breeches looking like a faun or a young satyr leaping ahead, stopped to wait for him, and then went off at a bound. … she was still there motionless and disturbing, with her voluptuous mouth and slanting eyes, with the expression of expectant sensual ferocity of a baffled cat. They were horrible. There was something grotesque in their decrepitude. Their toothless mouths, their hooked noses, the meagreness of the active one, and the hanging yellow cheeks of the other (the still one, whose head trembled) would have been laughable if the sight of their dreadful physical degradation had not been appalling to one’s eyes, had not gripped one’s heart with poignant amazement at the unspeakable misery of age, at the awful persistency of life becoming at last an object of disgust and dread. What I would like to see is an adaptation of this done by The League of Gentlemen. Wouldn’t that be a spectacle! We’re treated to a second M. R. James story now, and a slightly less well known one at that. The Rose Garden comes from James’ second collection, More Ghost Stories of an Antiquary. James writes this tale with a typically light hand and doesn’t stray far from his ‘antiquarian haunting’ theme, although he does leave his comfort zone a little by introducing a female character as the main protagonist. And what a character Mrs. Anstruther is! A no-nonsense type of woman who constantly hen-pecks her poor husband (who just wants to be left alone for the occasional round of golf). It seems she’s taken a fancy to planting a new rose garden in the grounds but refuses to take advice about the placement, even when it comes to the uprooting of an ancient wooden post. Silly thing to do when there is a latin motto involved – quieta non movere or, do no disturb the quiet things! If you’ll remember, I was talking about the comic interlude earlier with regards to Wilde’s The Canterville Ghost. Here, Wells gives us a far more successful example of the sub-genre. A wonderfully dry and dark comedy set in an Edwardian Gentlemen’s Club. A group of fellows have met up there on a Saturday after a round or two of golf. Relaxing with pipes after dinner one of them begins a tale of his experiences in the clubhouse the previous night, being the only one to have slept there. And so the framing story is set. Lean. You know that sort of young man’s neck that has two great flutings down the back, here and here—so! And a little, meanish head with scrubby hair—And rather bad ears. Shoulders bad, narrower than the hips; turn-down collar, ready-made short jacket, trousers baggy and a little frayed at the heels. ‘Boo!’ I said. ‘Nonsense. You don’t belong to this place. What are you doing here?’, I could see him wince. ‘Boo—be hanged! Are you a member?’ I said; and just to show I didn’t care a pin for him I stepped through a corner of him and made to light my candle. ‘Are you a member?’ I repeated, looking at him sideways. Of course, not even the undead are a match for the arrogance of the English gentleman! The narrator discovers that the ghost is stuck in this realm because he cannot remember the complex system of occult hand-gestures needed to send him back to wherever he came from. Not being an unkindly chap, the narrator assists the ghost in remembering them. This story was obviously a huge influence on the Ealing portmanteau film, Dead of Night. As mentioned earlier, there is a comic relief tale in the film concerning two obsessive golfers in love with the same woman. They decide to play a round of golf for her, the winner taking the young lady’s hand. After the loser commits suicide and haunts the happy couple the trope of the haunted assisting the hauntee to remember the complex hand-signals to make himself disappear is used; directly lifted, it appears, from the H. G. Wells tale. And to round the anthology off we have yet another well-known classic, Bram Stoker’s tale of a honeymooning couple touring Bavaria. This pair of newlyweds pick up with another tourist, an awful American braggart by the name of Elias P. Hutcheson. I would think this would be most people’s worse nightmare wouldn’t it, a gun-toting buffoon following you around on a romantic holiday? Seems like enough of a horror story already to me. However, our genial young couple do not seem to mind the intrusion and they all visit the famed Nuremberg Museum of Torture together. Throw into the mix a black cat and an Iron Maiden and there’s an accident waiting to happen. I’m sure it can’t just be my own peculiarity, but I was quite glad of the outcome of this one. Not for the cat, of course, but for Elias P. Hutcheson. And that brings us to the end of the anthology! Good one wasn’t it? Just goes to prove the old adage that you shouldn’t judge a book by its cover. Thank you, goodnight and may your God go with you. I’ve been doing a little digging into Dave Allen’s account of the local character from his youth he describes in the introduction, Old Malachi Horn. It appears that he either misremembered the name or it’s a misprint, as there was a chap that lived near Allen’s childhood home called Malachi Horan. Horan lived in Tallaght and Allen was born in Firhouse, just to the south. This was when the area was still rural, before the urban development of Dublin in the ‘60s and ‘70s. It also turns out that Allen’s belief that the old storyteller was 100 years old wasn’t far from the mark. In 1945, when Allen was 9 years old, Horan died at the ripe old age of 98! It also seems that Horan’s storytelling credentials were true, he is marked down as a folklorist and in 1943 one Dr George A. Little published a book of Horan’s tales and memoirs called Malachi Horan Remembers! There’s another book I want for my collection. What an excellent, fascinating and most scholarly piece this is Mr Nash. May I thank you sincerely for brightening up an otherwise dull afternoon with your erudite article. 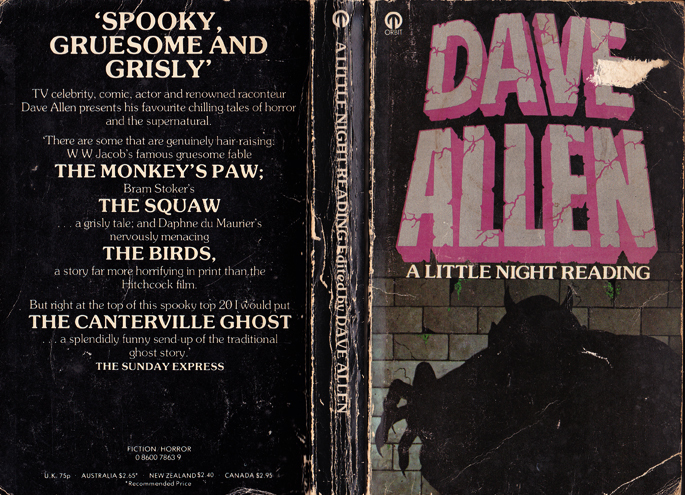 Dave Allen, horror anthology… what a strange world we inhabit the likes of you and I sir. Thankee kindly, Mr Scriber. It’s good to creak open the gates of the churchyard again. Hopefully I’ll be visiting on a more regular basis for a while. All the very best to you, my friend. I certainly hope so Mr Nash.